I am the owner of Bubba, a 22 year old Quarterhorse. The care that Bubba receives at Maple Valley Stables is incredible. As an older horse, Bubba has special dietary needs for which Larry and Julie constantly monitor and adjust, if needed. They truly pay close attention to his needs, his weight, and his demeanor. Julie and Larry also ensure that even when weather does not permit outdoor turnout, Bubba is able to be turned out in the indoor arena. The care that is provided is above all care that I have seen in other facilities. I have to say also that the indoor arenas are great. The larger, open sided arena is an amazing space! Thank you Julie and Larry for all that you do! I always know that Bubba is cared for even when I am unable to make it out to the barn! ~ Virginia & Bubba "
I have boarded Brody at Maple Valley for about 8 years now and I can only think of nothing but positive things about the farm. I just recently graduated from college and kept Brody here while I was away. My school was 11 hours away and I had no worries having Brody stay at Maple Valley, with me being so far away. Because of the special, individual attention each horse gets and the willingness of the MVS team to take care of every horse like their own I knew Brody would be happy, healthy, and safe while I was at school! The horses' health always comes first. The atmosphere at the farm is so relaxing making it such a lovely place to be and spending time with your horse and others in the MVS family. 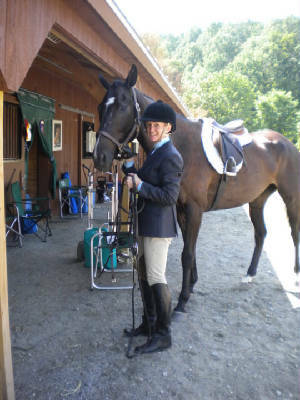 Brody is a thoroughbred and before coming to Maple Valley had his thoroughbred moments but since coming to Maple Valley the calm demeanor of the staff and boarders has created such a comfortable place for Brody that he is a completely different horse. Being at Maple Valley has also created so many opportunities for Brody and I to learn; it’s a great place to educate yourself and your horse. I appreciate the Maple Valley staff for all the great things they do and I can't thank them enough for giving my horse the best care! We can't tell you how much Maple Valley has meant to us these past five years. With all of Buddy's health conditions (lyme and laminitis to name just two), you spent many, many hours caring for him as you would your own. Meeting with the vets when we couldn't, grinding medications, flushing IV's multiple times a day, injections, special turnout and you never blinked an eye. "Anything he needs." you said. When Turbo joined our family, you welcomed him with open arms, working with the feed consultant to make sure he had the correct type and amount of grain and supplements for his age and work. He is so healthy and happy, we could not ask for more! Thank you, thank you, thank you for everything you do. Here's to many more years to come at Maple Valley! My name is Kelly and I board my horse TC at Maple Valley Stables. I moved up here from New Jersey, and was nervous at first to have my horse up here with me, being such a big responsibility. Days after TC and I began our time at Maple Valley Stables Julie and Larry put my nerves to rest. If I cannot come out to the farm for a few days or even weeks I feel very comfortable knowing that TC is receiving the love, care, and attention that he needs." 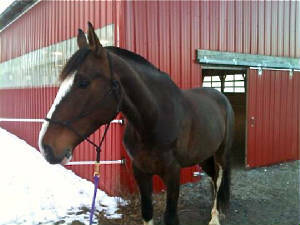 I moved my underweight and nervous TB, Nate, to Maple Valley in 2009. Their focus on nutrition and a calm atmosphere for horses turned him into a healthy, shiny and calmer horse. Julie and Larry have gone above and beyond in helping my horse and I through many challenging and difficult times. Nate can panic quickly and has certainly tested the dedication and love they have for the horses they care for. Once such instance, Nate spooked when his winter blanket broke and became entangled on the one below it. With blankets dragging, Nate broke through the fence and ran 26 miles down the road, through deep snowy pastures, traversed snowmobile trails through forests and even along the highway towards Essex. Anyone else would have called me at work and told me to come find my horse. But Larry and Julie together with the barn manager and friends tracked him, caught him and brought him home. By the time I arrived, he was hooked up to an IV and being treated by the vet. Without their love and dedication, my horse would surely have lost his life that day and I would have lost the most important thing in my life. Nate continues to challenge but with their patience and understanding together with the numerous available professional trainers ranging from Equine Behavior to various riding disciplines, a multi faceted training facility and good nutrition, I know I have given the best life to my horse. My family at Maple Valley Stables is always there to support me, celebrate my successes and help me to learn from my failures. I have been boarding my horse, Sienna at Maple Valley Stables for over 5 years now, and love the care they give my sweet girl. Sienna is 26 years old and I never worry about how she is doing. The care and attention given to her is wonderful. MVS always puts the horses first and treats every single one as their own. 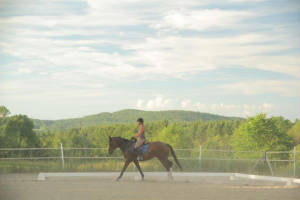 The facilities are awesome, and it is a very friendly barn that welcomes all disciplines. I would recommend MVS to anyone who is looking for a relaxed, worry free, well maintained facility were horse and owner enjoy all that is offered. Maple Valley Stables offers amazing care, dedication, cleanliness, communications, & facilities with wonderful owners and a staff who truly love horses and what they are doing. The welfare of the horse comes first and this is shown in the individualized care that each horse receives. 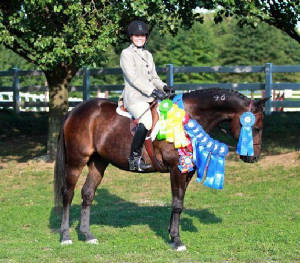 Boarders and trainers feel like they are a part of the family and know that their horse is well cared for. Having 2 indoors, a large fenced in outdoor arena with amazing fields allows boarders & trainers multiple areas to ride and train in and enjoy during all types of weather. Julie and Larry Reynolds are top notch people who run a safe, professional and topnotch facility. Maple Valley is an amazing facility but what sets it apart from others is the individualized and excellent care that my horse receives every day. groomed, the hay is high quality and the people are friendly and supportive. I highly recommend MVS!!! Jubilee and I moved to your barn in January of 2012. Your facility came highly recommended. We are so happy here and feel confident that my horse's health and safety are always the priority. The staff at Maple Valley is very professional. Everyone is helpful, attentive and friendly. The upkeep of the barn, tackroom and riding arenas are superb! My daughter and I love going to the barn to ride and enjoy hanging out with the other boarders. It feels great to know I dont have to worry about the health of my horse when I am not at the barn. I love it at Maple Valley, because our horses get fabulous care, the atmosphere is like family, but unlike some families, we all get along... and there are two indoors, so "no waiting".... and our horses eat hay from the property... and it's some of the finest hay I've ever seen..